When I was little, I used to make homemade chocolate ice cream with my grandmother using double bowls, ice, and salt. Imagine my delight when I spotted the Cuisinart ice cream maker at Macys.com. I persuaded my fiance that he would also enjoy homemade ice cream (no preservatives, simple ingredients) and we added it to our wedding registry. Well about a week ago, I came home to find a big box from Macy's on the front porch. It was an engagement gift from his Aunt Peggy and her boyfriend Bob! Inside the big box was the ice cream maker - we immediately started to plot our first batch. I was soooo excited! I wanted to make peppermint, and my fiance wanted something crunchy so we settled on mint ice cream with crushed Scharffenberger chocolate. The final product was creamy and light - sort of like a more substantial whipped cream. We have been enjoying it all week. The recipe we used called for milk, heavy cream, sugar, vanilla extract, peppermint extract, and chocolate chips. Next time I want to find a recipe that calls for eggs too so I can see how that changes the flavor. I also want to make a lemon verbena flavored ice cream. Do you have any favorite recipes (or flavors) we should add to the list? Thanks again Aunt Peggy and Bob! Introducing Custard and Omlet - Kevin's new chicks! 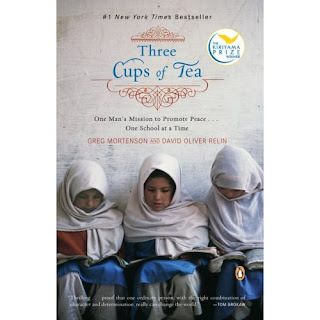 Recently I read "Three Cups of Tea" by Greg Mortenson. In 1993, while descending after a failed attempt to climb K2 in Pakistan, Greg got lost and wandered exhausted and sick into a small village called Korphe. Nursed back to health, he promises to build a school for the children of the village who at the time called a barren field their classroom. Fast forward 15 years, Greg is still building schools (131 to date), vocational centers, and infrastructure in Pakistan and Afghanistan. While at times I wish that the writing style had been more objective (Relin the second author uses quite flowery language to describe Mortenson as a hero), I very much enjoyed the book and felt inspired by Greg's conviction. The reason that I bring this up now is that parts of the book take place in Waziristan, the area in Pakistan where current military action against the Taliban is underway. Having read this book, this area is not the nameless, faceless place it would otherwise be. I really recommend this book as it provides context, contrast, and depth to the news stories flooding the papers about Pakistan, Afghanistan, and the roots of terrorism. If there was any doubt that Kelley's jello-shot-making ability had been forgotten after 2 long years in Pasadena... it has been put to rest after this weekend. 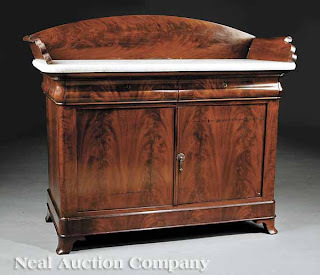 About a month ago I went home to New Orleans and browsed the Neal Auction house with my dad and fiance. 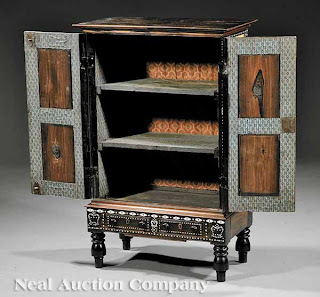 Inspired by the Victorian House tour this weekend, I thought I would share a few of my favorite pieces (the auction is already over by the way). For the record, Crescent City Auction usually has better prices. 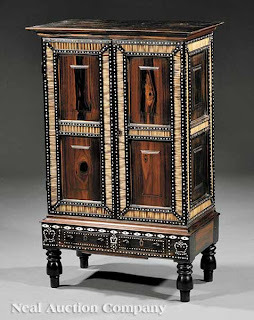 This was my favorite thing of the day, but at an estimated price of over $1000 - it was way out of my price range. There are a lot of cool things in auction galleries in New Orleans. The first problem is affording the stuff, the second problem is getting it to California! Ben suggested this weekend that I should write a post about my unconditional love of Chipotle burritos. I can't believe I haven't written about it yet! Today I was finally motivated when I saw that Chipotle plans to install solar panels at 75 restaurants around the country. (I am cheap so I don't pay extra for guacamole). * I am aware that I probably get a day's (or week's) worth of calories in this one meal. But it is sooo worth it. True love lasts a lifetime. p.s. I have even made a pilgrimage to the first Chipotle in Denver. I am a devoted fan. p.p.s. I have been known to win Chipotle eating contests (for the record Haas was no match for me). This afternoon I went up to the city for a cultured afternoon with two friends Niki and Audrey. 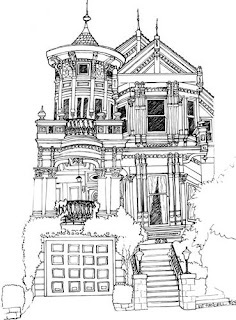 First we hit the Victorian Home Alliance of SF Tour of Victorian homes in Eureka Valley (neighborhood in the Castro area of San Francisco). All in all we took in 7 homes that ranged from homes that took Victorian decor very seriously (period wallpaper, fabrics, and furniture) to those that used it as a "fantastical" inspiration (dragons, fairies, masks from Vienna, etc.). We saw homes with a ton of personality oozing from all corner (mirrored chandeliers and interesting art) to those that almost looked staged for a real estate showing ("where is all their stuff?"). Upon leaving we headed to the Presidio theater to check out "The September Issue" - a documentary made about the making of the September 2007 issue of Vogue magazine (image below). It was awesome, but I left the movie particularly smitten with Grace Coddington, Vogue's creative director. “Always keep your eyes open because you never know what might inspire you” she reminds us in the final minutes of the movie. Coddington (who is 68) really stole the show with her charm, wimsy, and utterly romantic sensibility. Basically I drove back down the peninsula inspired both to have more interesting home decor and clothing! I couldn't wait to get home and get on ebay to start looking for interesting examples of both. Thanks for a great day ladies! The perfect kind of Saturday! On Friday I was lucky enough to hear William Kamkwamba talk. It was incredible. I left feeling very inspired by what he accomplished against all odds. He has recently written a book "The Boy Who Harnessed the Wind" which is next on my list. I wish William nothing but the best - he certainly deserves it. Last Friday I came home to find this waiting for me! My wonderful fiance had surprised me for our anniversary with some favorites - figs, flowers, champagne, pita chips, laughing cow baby swiss, strawberries, and a nibby bar. How does time fly! Today is blog action day - where bloggers around the world write about a common topic. The topic this year is climate change. As I write this, almost 8,000 bloggers have signed up. What am I going to write about? I work in the green energy field and my brother works for an oil company, so I thought I would write about a healthy (and on going) argument in my family. While I believe in climate change and he is still getting there, we both agree that resources are finite, that energy efficiency and conservation are very, very important, and that we need to exploring alternate (low carbon in my case) sources of energy. Water vapor is the primary greenhouse gas on the earth. I agree with you that water vapor is a potent greenhouse gas. You are right. However, it isn't a primary driver for climate change. The earth has been getting hotter since the ice age. Climate change is natural and has always been natural. During the post war economic boom climate was actually getting colder, scientists thought mankind was bringing on a new ice age using fossil fuels. Also, some amount of natural climate variability is natural. 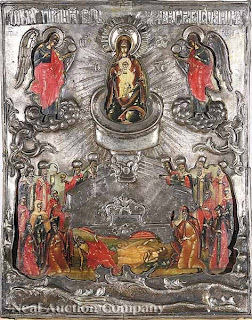 However, what is different this time, and makes this period of time unique in history is the RATE at which things are changing. 1998, the hottest year on record, was an el nino year. El nino causes more clouds = more water vapor = more greenhouse gas = hotter. Using the environment to try to enact global government is not new. 1998 was the warmest year on record. We are in the hottest decade on record. Also, the sea temps this past summer (July and Aug '09) were the warmest on record since they started measuring in 1880, some of which was caused by el nino (according to NOAA). Most CO2 in the atmosphere comes from decaying biomass. What is causing temperatures to rise? Increased concentration of greenhouse gases (CO2, methane, and nitrous oxide primarily) resulting from anthropogenic (human) sources. My brother and I will probably continue to disagree on the cause of climate change for a while to come. However our differing views lead us to a similar solution. My brother is motivated by peak oil and is interested in conserving resources and diversifying our energy mix. I believe in climate change, and want to conserve resources and reduce atmospheric concentration of CO2. I believe that RAPIDLY rising CO2 is causing increased ocean acidity, record high temperatures, and rapid melting of glaciers and sea ice. Even though our reasons vary, we end up at the same solution - resource conservation, alternative energy sources, and conscious decision making. When it rains I don't like my feet to get wet because I am then freezing for the rest of the day. A few years ago I got J. Crew rain boots that are pretty awesome. 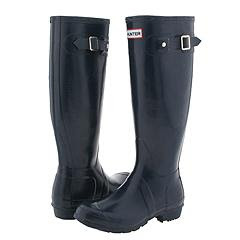 However, if I had to do it again, I would probably buy Hunter boots - they are really tall (thus keeping more of your leg dry). Hunter has been making rubber products for over 150 years and over a million pairs of wellington boots were worn in the trenches during WWI. You know I love a boot with some history! I hope you stay dry this week! Right now it is raining cats and dogs in the bay area - the remnant of Pacific typhoon Melor. What better for a rotten rainy day than snuggling up with a huge down comforter and an engaging mystery novel (well that's my plan when I get home from work). 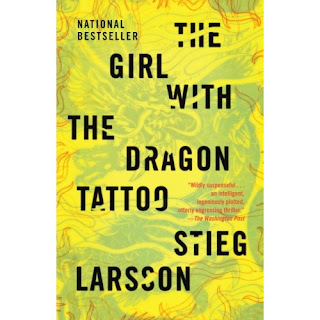 Right now I am reading "The Girl with the Dragon Tattoo" by Stieg Larsson - a Sweedish author who passed away in 2004 with three completed manuscripts not yet published. I don't want to give too much away, but the book follows a financial journalist and magazine publisher who has just been recently sentenced to a short stint in prison. He is then hired by a wealthy aging industrialist to ghost write his autobiography. However, the true purpose of his employment is to investigate a cold missing persons case involving the industrialist's brother's granddaugher - who went missing more than 3 decades ago. It is really suspenseful and the kind of book you want to stay up late at night reading - just one more chapter! I highly recommend it. If you let me know, you can borrow it from me when I am done. Last weekend, we went up to the Sonoma Coast to attend Cameron and Celina's wedding at The Ranch (Cameron's mother and step-father's home away from home) near Timber Cove. Everything was completely beautiful and charming. Below you can see the happy couple in the back of the photo listening to speeches under glowing lanterns. Celina walked down an aisle of carpets laid over the dried grass. Here is what the seating area looked like in daylight. Cameron's step-father cut the trees to make the poles that supported the strings of lights. It was something right out of a magazine. Congratulations to Cameron and Celina! I hope that you have a wonderful time in Hawaii! Next weekend (17th, 18th) is the annual Half Moon Bay Art & Pumpkin Festival. Although I have never been, it was always a popular event when I used to help organize social events for grad students. It seems like the perfect event to bring little kids to - a view probably influenced by Erik who took the most adorable pictures of his son at the pumpkin patch last year (see below). Erik takes great pictures of his son Ronan and posts them to his blog - The Bleary-Eyed Father. As Erik has been blogging, his photos have shown me of the power of a nice camera and a really nice lens. It doesn't hurt that baby Ronan is completely adorable and photogenic (check out his superman pose). 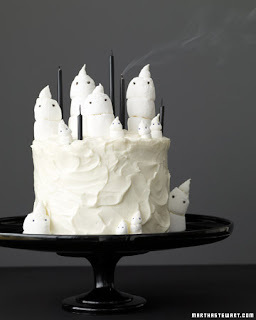 Check out this boo-tiful cake from Martha Stewart! I ain't afraid of no ghosts! Last night I went to see the new King Tut exhibit at the De Young museum with Stanford Alumni. Given my experience with past events, I was expecting 100 people - maybe. Imagine my surprise when we walked into a crowed atrium of over 900 alumni, family, and friends! As a kid I was obsessed with mummies for a while, so as soon as I heard about the Stanford event I booked tickets (it actually sold out in one day according to the woman working the door - good thing I had it on my calendar). The exhibit was good, although I will say that a large portion of it is dedicated to people who may or may not have actually been related to King Tut - "this is the urn belonging to a woman who MAY have been King Tut's great grandmother" (that kind of thing). There appears to be some doubt as to who King Tut's parents were. 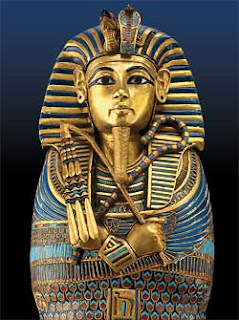 King Tut himself doesn't travel, but the canopic jar that once held his mummied liver did (see photo below). This jar was about a foot tall, the scale is hard to see from the image. By the way, when King Tut was alive, the pyramids at Giza were already over 1000 years old. My favorite caption was for the "magical brick of Tuthmosis IV" 1400 - 1390 BC. A magical brick was placed in the north, south, east, and west walls of his burial chamber and warned of the dangers of entering. The translated caption on the north brick reads: "You who come to pull [my hair], I will not allow you to pull [my hair]." I thought that this was a rather polite way to issue a deadly warning. Wedding cake is one of my favorite parts of the wedding, and in southern weddings you are often treated to two cakes - the wedding cake and the grooms cake (often chocolate or whimsical or both). Last night I uploaded my photos and here are the photos of some classic wedding moments. Mallory is probably one of the most photogenic people I have ever met! She was totally radiant on Saturday - it was wonderful to see them both sooo happy. Congrats! So I took about a thousand photos at my brother's wedding this weekend. Although I have yet to download my photos (thanks to a delayed late night flight and an early morning), I plan to upload and share soon! In the meantime, here are some favorites from the rehearsal dinner. Above we have Tommy and Mallory addressing the room. The bridesmaids with Mallory modeling their new engraved bracelets. More to come soon from this wonderful celebration! Mallory and Tommy are getting married today! Congrats to the happy couple! p.s. I took this photo when they got engaged last Christmas Eve. I am so excited to have a new sister in the family!! 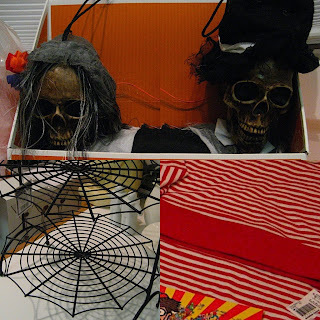 This year I am so excited for Halloween and have been thinking about costumes for a few weeks. While I have yet to buy one, here is a friend's dog in her Halloween costume - so cute! Can you say no to that face? 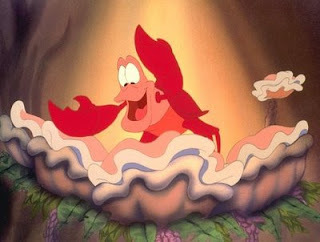 I think that she is supposed to look like a lobster. When researching yesterday's post on the history of the sazerac, I noticed that Wikipedia listed a cocktail book from 1930 as an early source for the sazerac recipe (even though the drink pre-dates the Civil War). The name of this cocktail book? 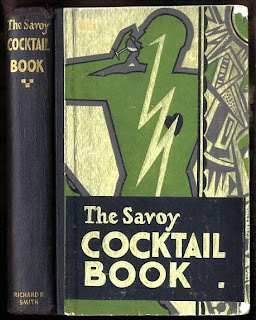 The Savoy Cocktail Book written by Harry Craddock. Savoy also happens to be the last name of the family band playing at our wedding - the Savoy Family band! Check out this amazing clip below. They are insanely talented and we pinch ourselves everyday when we remember that they are taking time from their busy schedules to play at our wedding! Savoy Family Band, 1930's Savoy sazaracs. Coincidence or fate? make your own wedding veil?